Hold onto your butts... because that seat is tiny. Universal has unveiled a nearly 18-minute fan recreation of Jurassic Park, with actors, animation, and puppets bringing some of the film’s most classic scenes to life. You know what they say: Fandom, uh, finds a way. 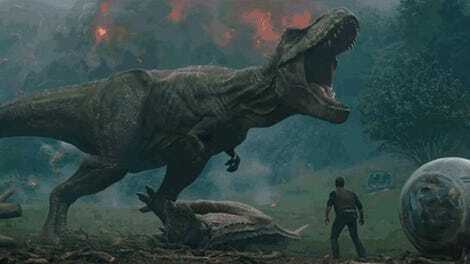 According to a press release, Universal and Tongal—with the help of Jurassic World stars Chris Pratt and Bryce Dallas Howard—asked fans to submit clips remaking iconic moments from the film to celebrate its 25th anniversary, receiving hundreds of submissions from fans in almost 30 countries. It’s a long video, nearly 18 minutes, and packed with a lot of fun moments and silly recreations. My personal favorites are anytime the puppets show up, or the car scene between Dr. Alan Grant and Timmy. Then, of course, you’ve got the T-rex. Universal probably isn’t going to make “a boatload of money” on this video, but it’s a great way to celebrate the 25th anniversary of this iconic film. Plus, I’ll take any excuse to see someone running in a giant T-rex costume. You can check out the tribute below.